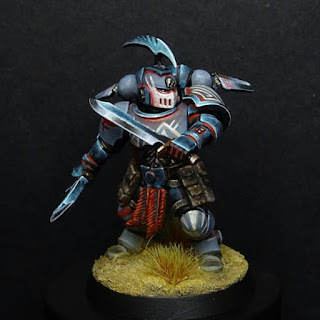 As those guys received a lot of love on the community (eavier metal facebook groupe and instagram in particular) I made a tutorial on how I paint them. I don't do tutorial that often so if you have some comments, advices, questions or if you just happen to appreciate this article/blog don't hesitate to drop a comment ;) ! First we will see how I make the grey with red hue armours plates of my sharks. For that I use : Prince august blue/grey, Scale75 indian shadow, GW dumbull Brown and finaly Prince august fluo orange. On a black undercoat I use the Grey/Blue as base coat. Then I use the Indian shadow to put the first shadows. With a well diluted paint I put a little pool of paint along the corner of the armour parts. I then "push" it toward the shadows with a brush wet with saliva (this is known as the two brush blending technique and I use it a lot) going back and forth with the paint I creat a little red area blended with the blue grey. After that I use the dumbull Brown only on the deepest shadow to increase the red tone. Finally I use a little touch of orange fluo paint in the center of the plate corner and in the angle of the shoulderpad. Don't be too heavy handed on this effect and dillute the paint 3/1 in order to get a translucent paint that will leave a nice orange hue without covering the red. For this part I will use a knife and the shoulder pad trim of another guys (he was on the Indian shadow stage of the previous part). For this I use three colors : Scale75 Caspian blue, caribbean blue and Prince august shinny white. First I use the caspian blue on large surface. On the shoulder pad trim I leave a black area between two blue area. I put a little "pool" of paint on the surface I want, then I use saliva to blure/blend the edge of the pool. On the knife for exemple I put my paint on the 3/4 of the blade, then I push the paint with saliva from the shadow toward the Hightlight and edges. Use well diluted paint and apply 2/3 thine coat that way (Duncan spirit possesse me sometimes)..
After that I use caribbean blue and I repeat the first step on a smaler area. Here I put the "pool" on the angle of the trim and on half of the colored area of the blade, bluring the edges of the pool with the previous caspian blue. Then I use a mix of caribbean blue and shinny white and I reapet the last step on an even smaler areas. I also use this mix to make a lining on all the edges. Finally I use pure white to put some highlights dot or making the lining stronger on the edges. Befor this step you can also use black on the darkest areas and use the same technique as for the Hightlight but backward. With a little pool of black on the dark area of witch you'll blend the edges with the caspian blue that should be nearby. Here is some pictures of the processes applied to the entire model that lead at the final armour including the tattoos. Excellent Tuto, merci. C'est rafraîchissant de voir des modèles de cette qualité peints entièrement au pinceau! Bravo, très inspirant!